Last July Mario Draghi surprised markets when he vowed to do anything – whatever it would take – to save the Euro. He didn’t go into details, he didn’t really need to. He simply informed his audience that whatever he did it would be enough. What I suppose no one – not even Mr Draghi himself – imagined at the time was that doing precisely nothing would turn out to be sufficient. Yet since that time that is just what has happened, he has done nothing, nothing whatsoever – no bonds have been purchased and no country has even asked for aid. So to date this verbal style intervention has been exactly what he said it would be, enough. Then in November Shinzö Abe, at that point a candidate who looked highly likely to become Japan’s prime minister, spoke out over the problem the high yen was causing the country’s exporters, and the desirability of his country’s central bank conducting substantially more bond purchases to fight deflation and drive down the yen. 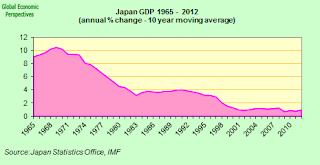 The result was not hard to predict – the Japanese currency came tumbling down. Mr. Abe on Sunday called on Japan’s central bank to resist what he described as moves by the U.S. and Europe to cheapen their currencies and noted that a yen level of around ¥90 to the dollar—it was at ¥84.38 in early Asian trading Monday, down from ¥84.26 late Friday—would support the profit of Japanese exporters. 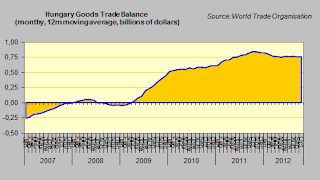 “Central banks around the world are printing money, supporting their economies and increasing exports. America is the prime example,” said Mr. Abe, referring to the Federal Reserve’s policy of flooding the market with dollars by purchasing massive amounts of Treasury bonds and other assets. 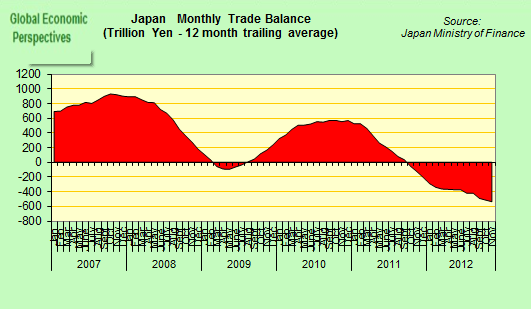 “If it goes on like this, the yen will inevitably strengthen. It’s vital to resist this,” said Mr. Abe, who will become prime minister on Wednesday. Now, surprising as it may sound, the latest player to join this intriguing new game is not the ECB’s Mario Draghi. Far from being eager for more verbal fun he will have none of this even as Euro Area economies wilt. No, the latest player is Hungary’s economy minister, György Matolcsy. Since the end of last year he has now spoken out no less than five times on major policy issues, each of them related directly or indirectly to the value of his country’s currency, and each and every time he has provoked a sudden and sharp forint weakening. 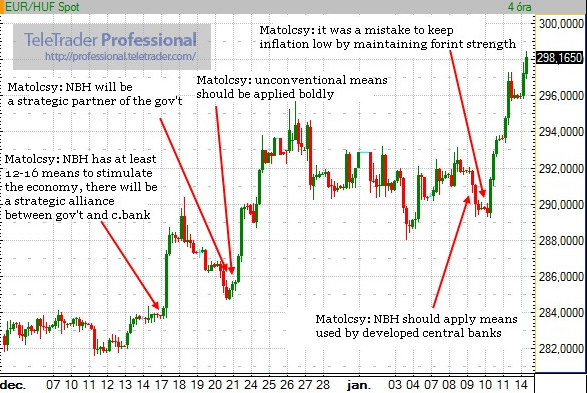 Topics covered have ranged from issues involving central bank independence, through unconventional monetary policy measures to the latest (January 10) declaration that it was a policy mistake to try and keep inflation low by maintaining a strong forint. One curious footnote to the phenomenon is that in the wake of the furore being produced inside the country by the sudden shifts in value (not everyone is convinced a weaker forint would be a good thing) the Economy Ministry felt forced to issue a statement blaming a research report by non other than Nouriel Roubini for the last in the line of abrupt market movements. 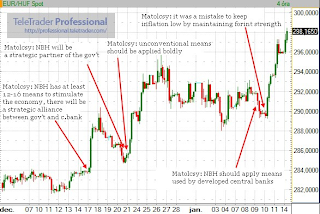 According to the Hungary Economy Ministry statement, the forint began to depreciate after Roubini said in a newsletter that failure to secure a deal with the International Monetary Fund was bad news for the currency. Consequently RGE advised investors to short the currency. Naughty Nouriel! 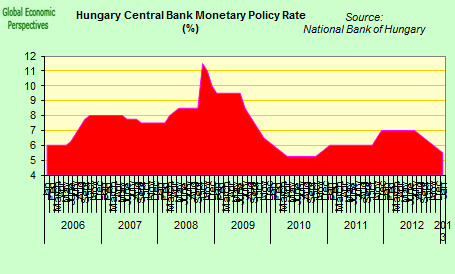 “It has become clear that the weakening of the forint since the middle of the week was not triggered by an article of the Minister for National Economy,” instead, the ministry suggested that it was speculators who were using this as “an excuse to mask their attack.” Naturally, as RGE analysts stress, it is much easier to sell the wicked speculator version to a voting community with only low level macroeconomic analysis skills. But my choice of Japan and Hungary for this comparison is far from being an incidental one. Both countries, arguably, suffer from one and the same problem – structurally deficient internal demand due to an ageing and declining workforce. Logically this phenomenon, which we are now witnessing in an ever growing number of developed countries, produces a continually stronger dependence on exports for achieving headline GDP growth, a dependence which creates the surprising situation that even countries with a significant current account surplus can find positive economic growth hard to come by. 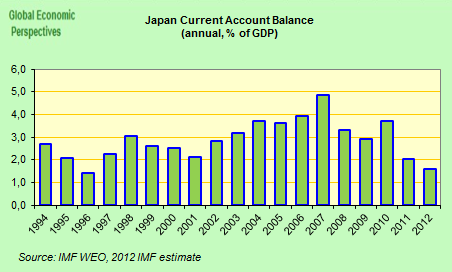 As it happens, both Japan and Hungary now run current account surpluses. Japan’s has been a constant over many years (although it is now notably weakening) while Hungary’s is more tenuous, and of more recent origin. Yet despite these surpluses in both cases growth is very weak, and during the second half of last year both economies remained mired in recession. Japan’s economy surprised once more on the downside in Q4 2012, contracting by a worse than expected 0.1% over the last three months of the year. 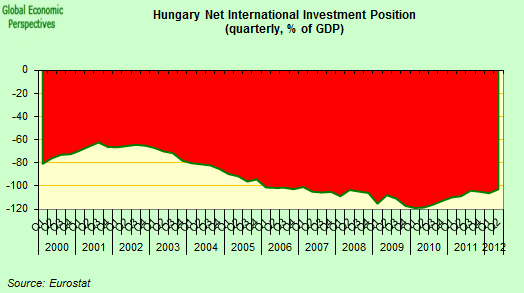 Hungary’s performance was a real shocker, with output falling 0.9% on the quarter and by 2.8% year on year, sending the economy back to a level it first achieved at the start of 2005. The sad truth is that long term trend growth in both countries is very low- Japan’s 10 year average is now under 1%, while the Hungarian equivalent is only slightly higher. Perhaps the Japan case is not so surprising. After all most economists and analysts now recognise that ageing and declining populations will inevitably slow growth, although many, like Paul Krugman here, think that this is not so dire as long as GDP per employed worker continues to perform well. Many, on the other hand, may be surprised by the situation in Hungary, especially since it is still, in theory a catch up, converging economy. Indeed one can be forgiven for being surprised since the country’s leaders from both main parties have consistently argued that trend growth for the country should be something like 4%. 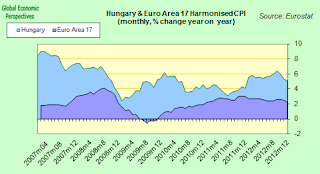 This kind of assumption is made in the original Széll Kálmán plan which informs the policy of the present government and lay behind the 2009 statement of the then prime minister Gorgon Bajnai that “Hungary’s potential economic growth should be 2 percentage points over the corresponding EU figure in order to ensure convergence”. “Market analysts tend to assume in their debt models a 2% economic growth for the Hungarian economy. The National Bank of Hungary estimates currently a 2% potential GDP growth rate, however, it does not mean necessarily the long-term economic growth. A few years ago the estimates were higher and it seems to be possible that adequate reforms to encourage employment would result in a 3-4% or even higher potential GDP growth rate”. This around 4% potential growth rate has been a regular theme over the years, with the only other constant being its non achievement, which, as I have been arguing all along is hardly surprising due to the country’s dire demographics. 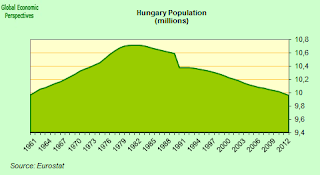 If we compare with the case of Japan, the actual fall in population is much more severe in Hungary. and the decline in the labour force (population 15 to 64) is now unrelenting. Nor is it any real consolation to find out, as Paul Krugman puts it, that the lower trend growth rate is actually “not bad” since “you can argue that demographically adjusted, the whole tale of Japanese… [or Hungarian, EH)….stagnation is a myth” since what matters are the debt to GDP dynamics being produced by the much higher elderly dependency ratios. These are what will tell us whether a country is on a stable or sustainable path or not. Saying that Japan (or Hungary’s) “performance isn’t that bad given the shortage of Japanese” (or Hungarians) seems to magnificently fail to get the point. On the other hand, to state that “while there is much shaking of heads about Japanese debt, the ill-effects if any of that debt are by no means obvious,” is surely to make a historic error of judgement of monumental proportions. 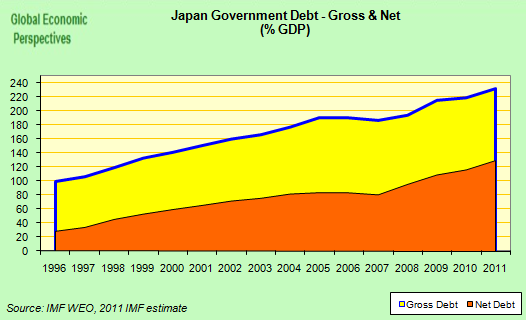 (For a fuller discussion of the theoretical issues raised by Japan’s debt problem, see “The Looming Singularity“). Having made this comparison, there are of course many ways in which the two countries differ, and some of them are very important In the first place Japan has been struggling with a very high yen parity, which has seen the country’s goods trade balance steadily drift into the red. 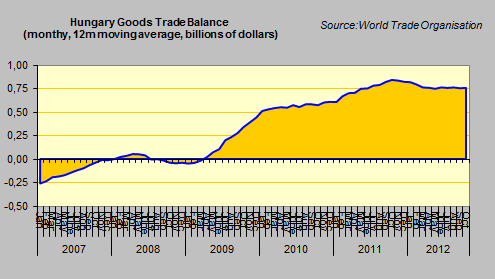 Hungary on the other hand has no such problem, since the trade balance is well in surplus. 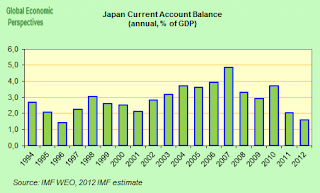 Differences also emerge when we drill down into the respective current account surpluses, since while Japan’s is largely boosted by an income flow from a large stock of overseas assets (see second chart below – Japan has a positive NIIP of around 50% of GDP, click on the image for better viewing), in the Hungarian case we find the inverse – the large negative international investment position (around 100% of GDP) leads to a negative income flow which mitigates the impact of the significant trade surplus. And there’s another aspect to the Hungarian situation that needs to be taken note of, and that is the fact that one of the reasons for this very high negative net external investment position is the fact that government debt was reduced to some extent during the early years of this century by a SELL-OFF OF STATE ASSETS. Now this kind of sell off often highly desirable, but in a country with an external debt problem there is one important condition – the purchasers need to be domestic savers. 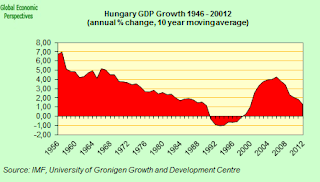 If there are insufficient domestic savers, as was the case with a country like Hungary with a large current account deficit, then the external debt simply shifts from being public to private, which looks good in an accounting sense if what you are concerned about is the size of public debt, but since the debt still needs to be serviced the macroeconomic implications are often not that significant – an external debt is still an external debt (even if it only shows up on the net external investment position, rather than under the external debt account) and it still has to be serviced. 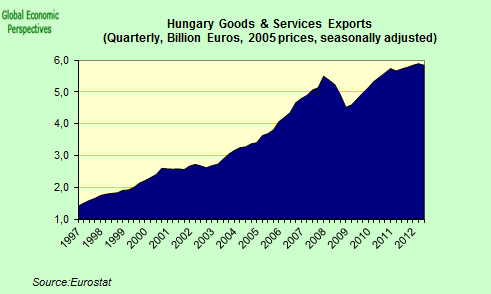 Indeed part of Hungary’s monthly exports still effectively go to pay the interest charges (or dividends). So Troika representatives be warned, in Portugal and Greece you can only get so much juice out of a single lemon, and while privatization looks good on the sovereign debt balance, if what you are after are solutions to external debt burdens simple asset sales may not be as productive as they seem. 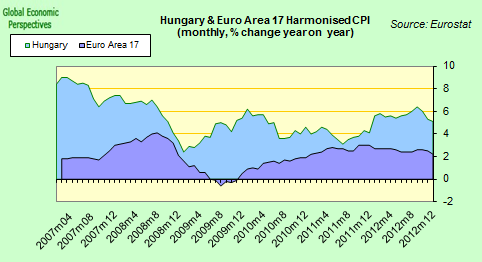 A second major difference is that Hungary hasn’t got a deflation problem. In fact it has an inflation one, which is hard to understand in an economy which has seen domestic demand deflating for so long. Certainly you couldn’t exactly say the economy was “overheating”. The second major difference is that for all the talk of unorthodox policies, monetary policy is conducted well away from the so called “zero-bound”. In fact the central bank monetary policy rate is currently running at 5.5% – and that is after six quarter point rate cuts over the last six months. Prior to that the reference rate was 7%. Hardly stimulative policy, but this is just the point, with an external debt of around 60% of GDP which needs to be financed interest rates have to be maintained high in order to sell the debt, and keep external investors inside the country. Just this week Hungary issued 3.25 billion 5 and 10 year US dollar denominated bonds paying 345 basis points and 335 basis points over the respective US Treasuries. And this is during a period of global “risk on”, under conditions of “risk off” the country would surely need to be negotiating with the IMF again. 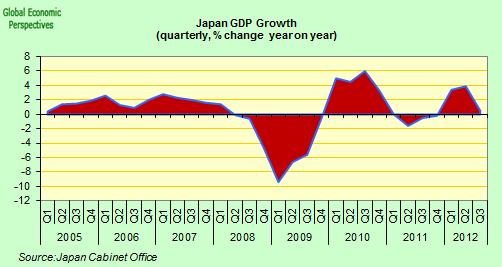 So to go back to where we started, with the various attempts to talk down JPY and HUF, the difference is clear enough, isn’t it. 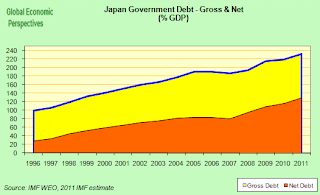 Japan can do this since far from having external debt it has a very large positive external balance, which means the yen value of its assets goes up. In Hungary we have the exact opposite situation, whereby any fall in the value of the forint forces up the HUF value of the external debt, and with it the size of government debt as a proportion of GDP. So while both countries may wish to try and increase the scale of their export operations to try and squeeze out some more growth, only one can do it (and even then only with the implicit blessing of G7 central bankers if they don’t want a verbal currency war to become a sanctions based trade one). Who Is Turning Into Whom? What I have tried to do here is two things. 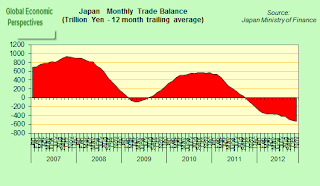 In the first place draw attention to the flaw in the reasoning of those who argue in the Japan case that the sovereign debt problem is benign since the BoJ can always monetise it and swallow part of the losses if need be. 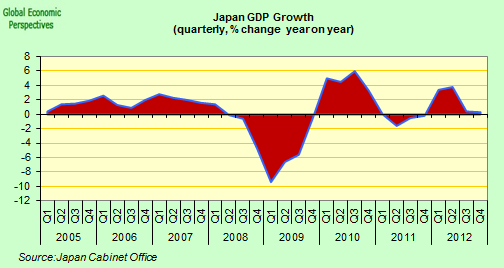 The BoJ can do this for just as long as the country maintains a significant positive external stock of assets. 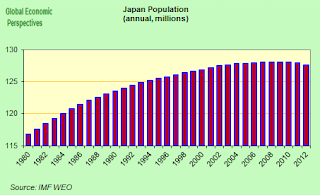 But as these are drawn down as the elderly population need their savings, Japan’s current account will steadily deteriorate (as it already shows signs of doing) until the country reaches the point that it will look more like Hungary than, say, Germany, and end game will draw near. On the other hand I have emphasized how Hungary’s deteriorating demographic profile makes it look increasingly look like Japan, without the large external asset base, and without the deflation. I have been arguing on my Hungary blog since 2006 that this is where we were going and that something serious and substantial needed to be done to address the demographic issue. Unfortunately there has not been one serious study either from the IMF, or from the EU, or from the World Bank, or from the OECD which has tried to situation Hungary’s ills in the context of its demographic trajectory. Hence nothing, absolutely nothing has been done to address the issue. Hope may spring eternal, but opportunities don’t – they are played out in finite time. This week I have already drawn the conclusion that it is probably now too late for Japan to avoid becoming another Hungary. It is hard not to escape the conclusion that it may now also be too late for Hungary to avoid becoming another Japan. Laszlo, I agree with you. But it is depressing in the end. Democracies are starting to malfunction all along the EU periphery, with the weight of older voters squashing the young, who are now packing their bags and leaving in increasing numbers. We still don’t know what the end game will be in a country like Hungary, but it doesn’t look like its going to be pleasant. There doesn’t seem to be any simple “hidden hand” that will correct all this. Hungary and Japan are interesting in their different ways for the varied insights they give us into our common future. Mr. Hugh, Hungary is a somewhat “specific” case. First of all take into account that the population decreased even during the last decade of socialism. Why? Because it had a “semi-market” economy with a “semi-welfare” system. Of course it was not sustainable, they financed it from foreign loans. That was one of the reasons why it came crashing down in 1989. The government then, in order to prevent civic unrest and to guarantee the social, political and economic positions of the ex-socialist elites sent many ex-employees into early retirement or gave them disability pensions. For example in 2010 the number of “disabled” people in the country was over 800 000!!! So that are the reasons why approximately half of the eligible voters are pensioners. What did Benjamin Franklin say? “When the people find that they can vote themselves money, that will herald the end of the republic.” And yes, the people found out that they “can” vote money to themselves. How will the end look like? There will be no revolutions, no widespread public unrests in a country like Hungary. Elderly people usually don’t have the “youthful energy” needed for such things. The infrastructure and the healthcare system will certainly break down. As you mentioned, in Japan they at least have some overseas assets, which can help finance the country for the next few decades, but in Hungary the system will slowly deteriorate until it reaches the bottom. How will the society or the economy look like when it reaches the bottom? I don’t know. I would bet it will look something like present day Bulgaria or Belarus, maybe even Moldova. Do you know why this is happening everywhere in developed countries? It’s because of the pension system. It doesn’t motivate people to have children. Just think about that. How would the reproductive behaviour of people in developed countries change if, for example, the pension they receive was tied to the amount of taxes paid by their children? Or what would you say if single and/or unmarried people without children would have to pay higher taxes than married couples with children? You can call it a “bachelor’s tax”. For example in Czechoslovakia during socialism such a tax existed. It depends on the costs, financial and otherwise, of raising children. Why do you think there should be a straightforward relationship between GDP growth and a current account surplus? Not all countries are like China. In 2009 Latvia recorded it´s largest current account surplus ever and at the same time a contraction of GDP of almost 20%. Exports fell enormously, but imports even more.